MOVE team members in New Orleans. Photo by Joshua Lewis. We have recently submitted several publications based on empirical data generated in Cape Town and New Orleans as part of the MOVE project. 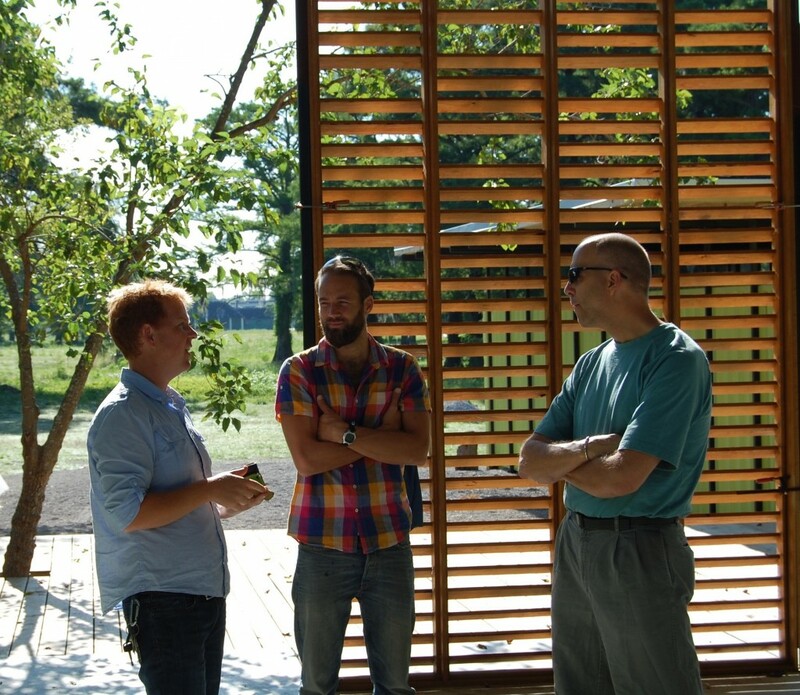 Joshua Lewis from the Tulane University’s new ByWater centre, just re-submitted as lead author together with other MOVE authors, our first New Orleans-based ecology paper to the journal EcoSphere. It is based on an extensive vegetation analysis that measures the response from Hurricane Katrina in the greater metropolitan area of New Orleans (NOLA). Importantly the paper also contextualise these patterns through an environmental justice and historical ecology lens to make interpretations of social ecological dynamics rooted in history and the unequal geography of New Orleans. This is one of the first of this kind, a study of urban vegetation response to large-scale social-ecological disturbance. Pippin Anderson at the Department of Environmental and Geographical Sciences at the University of Cape Town, together with co-authors from MOVE, also just submitted our first Cape Town-based ecology paper to Ecology & Society. The paper is based on our sampled vegetation analysis across Cape Town’s unequal neighbourhoods; from elite and middle-class white-dominated areas to working-class coloured and black-dominated townships and informal settlements. This paper uses a traits-based analysis to develop notions of how apartheid spatial planning and the postapartheid situation have created legacies in the functional diversity of vegetation and develops insights what this could mean for landscape ecological processes. For Cape Town this is one of the first studies of this kind. Being renowned for its high biodiversity, which has also lead to a “fynbos-focused” bias in knowledge production on urban ecology in Cape Town, this is one of the first studies that develops a systematic study of all urban vegetation, the so called “urban matrix”, including vegetation of derelict urban spaces, private gardens and settled areas that lie outside of nature reserves and biodiversity hotspots. Recently I submitted with Mario Diani from the University of Trento as lead author, together with Lorien Jasny at the University of Exeter, submitted a first analysis of our CIVNET social network study of collective action in Cape Town to a special issue in journal Voluntas. Recently I also published a paper in Landscape and Urban Planning with scholar and landscape designer Hanna Erixon from KTH. Theoretically it combines my previous work around value articulation and collective action with a discussion of the role of landscape designer from Hanna’s studies. We developed a comparative study across three cities—Cape Town, New York and London—of the making of urban landscape interventions that had different degrees of professional landscape architecture involvement. I brought my studies in Cape Town about the struggle to stop a shopping mall being built at the Princess Vlei wetland, which was compared with Hanna’s studies of the High Line in New York City and the landscape architectural project A Horse’s Tail in London. Two other MOVE-related publications are also ongoing. Joshua Lewis and I are re-submitting to Progress in Planning, his extensive historical analysis of infrastructures and ecosystem dynamics in New Orleans and how they feed into political disputes in the Louisiana coastal ecosystems. Together with Sverker Sörlin at KTH I have also just submitted the Grounding Urban Natures book to MIT Press. This edited volume is now out on review and contains excellent chapters that critically analyses urban environmental politics and histories across cities of the world. Joshua Lewis has one chapter in this volume, and I have three with bearing on the MOVE project. Other chapters are from leading scholars from anthropology, geography and environmental history (read more here). Here are the papers and below you also find the abstracts. Figure from earlier publication by Pippin Anderson, Georgina Avlonitis and Henrik Ernstson based on work in the MOVE project. Abstract. Despite growing interest in urban resilience, remarkably little is known about vegetation dynamics in the aftermath of a major urban flooding. In this study, we examined the composition and structure of plant communities across New Orleans (Louisiana, USA) following catastrophic flooding triggered by levee failures during Hurricane Katrina in 2005. Focusing on eight neighborhoods that span a range of demographic and topographical conditions, we assessed whether plant communities in post-Katrina New Orleans reflect flooding disturbance and post-disaster landscape management policies. We then contextualized vegetation patterns and associated ecosystem services and disservices with census-based demographic trends and in-depth interviews to draw inferences about the drivers and outcomes of urban land abandonment in the aftermath of catastrophic disaster. We found that areas subject to the greatest flooding disturbance exhibit the highest rates of vegetation response. Disturbance intensity and elevation, however, are relatively weak drivers of vegetation differences among the studied neighborhoods. Rather, we found that household income, racial demographics, and land abandonment intensity are important drivers of vegetation community composition and structure across the city following Hurricane Katrina. Our findings indicate that resettlement and landscape management policies can mediate post-flooding ecological outcomes, and further that unmanaged, emergent vegetation on abandoned lands can be an environmental justice concern in underserved communities. Abstract. In this study we explore species richness and traits across two urban gradients in the City of Cape Town. The first is across the natural-urban boundary and the second is across a socio- economic gradient informed by historical race-based apartheid planning. Plant species and cover were recorded in 156 plots sampled from conservation areas, private gardens, and public open green space. The socio-economic gradient transitioned from wealthier, predominantly white neighbourhoods to poorer predominantly black neighbourhoods, and ultimately in to poor informal settlements. The socio-economic gradient was selected to fall within one original vegetation type to ensure a consistent original biophysical template. There is a marked shift between the natural and urban plant communities in the City of Cape Town, with little structural and functional affinity. Urban landscapes are predominantly grasslands, with little structural and functional diversity when compared to the natural counterpart. A significant ecological gradient of reduced biodiversity, traits, and in turn functionality, was found across the socio-economic gradient. 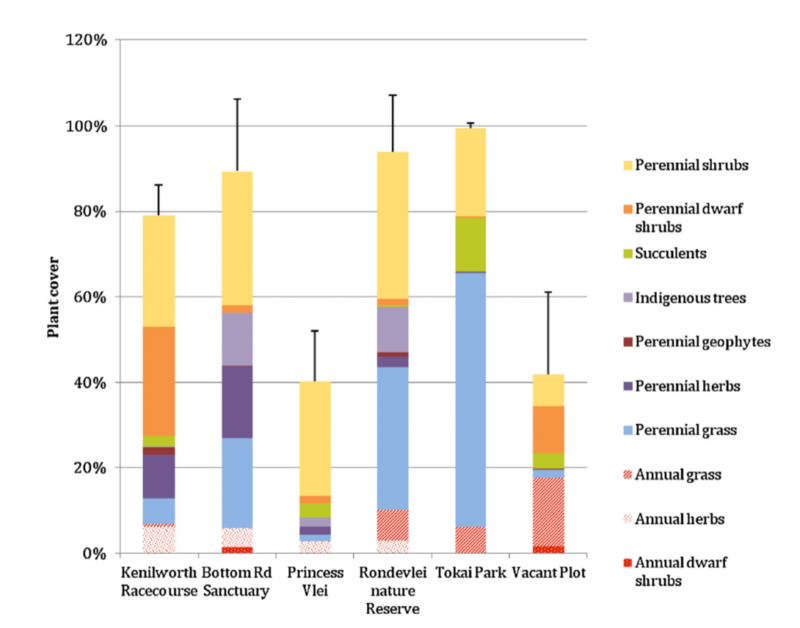 Wealthier and racially more white communities in Cape Town benefit from more private green space, more public green space, and a greater ecological diversity. Poorer, and majority Black and so-called Coloured, communities have limited green space on all fronts, and what is there, is ecologically ‘poor’. This ecological poverty mirrors historical apartheid planning that is resistant to change. Recent linkages between ecosystem properties, diversity and functionality, ecosystem services and vulnerabilities, suggests a significant environmental injustice persists in the City of Cape Town. 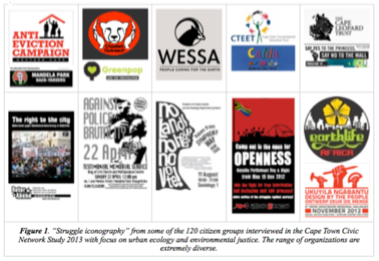 Iconography from civil society organisations that are mobilising on the urban environment in Cape Town and that participated in the CIVNET study as part of MOVE. Abstract. This paper proposes a network analytic approach to the role of symbols in shaping the structure of civic organizational fields. More specifically, it looks at the expression “Right to the city” (RTC) both as a specific symbol and as a broader frame, and explores its influence over the patterns of collaborative ties among 129 civil society organizations active in Cape Town from 2012 to 2014. The article addresses two broad questions: What is the relation between RTC and other symbols that are also frequently invoked to describe urban struggles and issues? Do RTC symbols affect the structure of urban civic organizational fields in significant ways? The analysis suggests that while RTC plays a significant role in local civil society, it is not the only interpretative frame that Capetonian civic organizations draw upon to characterize their activity. “Urban conservation”, especially tied to nature conservation and environmental issues, shapes the structure of local organizational fields in a more salient, if possibly more divisive, manner. Abstract. This paper addresses three interventions into urban green spaces—a wetland in Cape Town, a post- industrial site in New York, and a park outside London. Through their different contexts, they help to grasp a wider phenomenon: the protection of urban nature through the development of protective narratives. We analyze these interventions as examples of “value articulation”, which we view as a relational and sociomaterial practice that requires the enrolment of people, plants, and things that together perform, spread, and deploy stories about why given places need protection. For each case study, we also highlight the moments when narrative practices move beyond mere protection and start to change the very context in which they were developed. We refer to these as projective narratives, emphasizing how novel values and uses are projected onto these spaces, opening them up for reworking. Our analyses of these successful attempts to protect land demonstrate how values emerge as part of inclusive, yet specific, narratives that mobilize and broaden support and constituencies. By constructing spatial linkages, such narratives embed places in wider geographical ‘wholes’ and we observe how the physical landscape itself becomes an active narrative element. In contrast to rationalist and external frameworks for analyzing values in relation to urban natures (e.g., ecosystem services), our ‘bottom-up’ mode situates urban nature in specific contexts, helping us to profoundly rethink planning and practice in order to (i) challenge expert categories and city/nature dichotomies; (ii) provide vernacular ways of knowing/understanding; and (iii) rethink the role of urban designers.